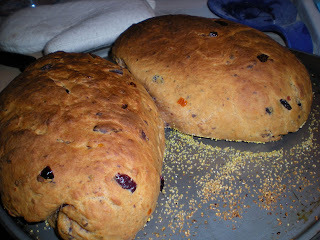 This week Friday cooking, my Mexican friend baked Mediterranean bread with a touch of sun-dried tomatoes. 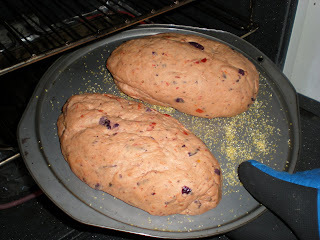 Everyone loved these breads and it is my pleasure to share her recipe. To be warned, this is a long process. 1. 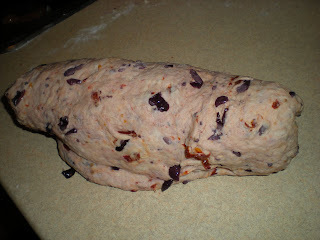 In a large bowl, mix together 3 cups of flour, yeast, salt, black olives, cheese, olive and water. 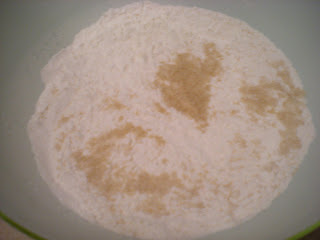 Add the last cup of flour little by little until it reaches a smooth consistency. 2. Turn out dough onto a floured board. Knead until smooth and elastic, 5 to 10 minutes. If necessary, add more flour. Set aside in a bowl and cover with a warm towel. Let it rise in the oven with light on for 45 minutes, until double in size. 3. Punch down. 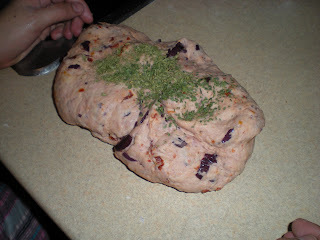 Add coriander and knead well again, for about 5 to 10 minutes. Let it rise for about 30 minutes, until double in size. 4. Again, knead for 5 to 10 minutes and finish kneading with a coating olive oil. Let it rise until double in size. 5. While it is rising, put a pan of water in the bottom of the oven. 6. Preheat oven to 475F. Cut the dough into 2-3 pieces and shape it into your favorite geometry. 7. Bake dough for 15 minutes. Reduce heat to 400F and bake for 30 more minutes, or until done. This bread sounds so savoury and delish!